Tenerife's answer to Lost World, the tiny hamlet of Masca is the second most visited destination on Tenerife after Teide National Park, and with good reason. The first non-Canarios who discovered Masca must have felt like they had stumbled onto Isla de Muerte and uncovered the hidden treasure. And according to tour operator myth, that analogy is particularly apt as Masca is often said to have originated as a pirate hideout. In reality, the tiny settlement was the last refuge of Tenerife's original inhabitants, the Guanche, who held out against the inevitable conquest in the caves of its deep barranco (ravine) and its steep cliff walls. For centuries a small community farmed the precipitous terraces where two gorges meet and it wasn't until the road connecting Santiago del Teide to Buenavista was constructed in the 1970s that the rest of the world found Masca. Much more a day trip destination than somewhere to buy your timeshare apartment, the only accommodation in Masca is of the self catering, rustic variety. Packed to their original rafters in charm and character and around a 40 minute round trip by car to the nearest supermarket, the handful of rooms in the hamlet tend to be favoured by hikers. Entertainment in Masca has two main strings to its bow - the white knuckle drive from Santiago del Teide into the village that descends down switchbacks steep enough to send you straining against your seat belt, and the endurance obstacle course of the hike down Masca barranco to the sea. 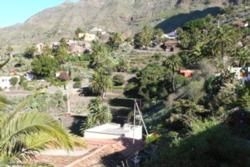 One is unavoidable if you want to see this Tenerife must-see, the other is entirely optional. Those who do the three hour hike down the Jurassic ravine are rewarded with time on the deserted, pebble beach of Masca bay before being ferried to Los Gigantes by boat and spending the next four days walking like 90 year olds. In the upper side of the settlement known as Masca Lomo, a small, quirky museum in a hobbit-sized cottage, typical of the houses in Masca, is set out exactly as it would have been for those who farmed the terraces for a livelihood before the advent of tourism. Now everyone who resides in the village makes their living in some way or another from the visitors who flock here. From handmade straw hats to hand crafted jewellery, you can buy souvenirs which are unique to Masca and help to keep the village alive at the same time, which is rather a nice thought. Unsurprisingly, many of the village houses have been converted into restaurants and you can find some excellent home cooking in the hamlet, including cactus lemonade and cactus ice cream...guess what grows well in Masca? On the terrace of El Guanche restaurant which doubles as a viewpoint with one of the most spectacular views in Tenerife, you can even get organic and vegetarian home cooking. Incidentally, although the pirate stories are unfounded, those in relation to witchcraft are not, and the village enjoys its folklore of local shape-shifters and mischief makers. So if a black cat happens to cross your path in the village, for goodness sake don't run it over – you never know who it might be. If you would like to book the highly rated Masca to Los Gigantes Trek and boat tour, please click here to do so.